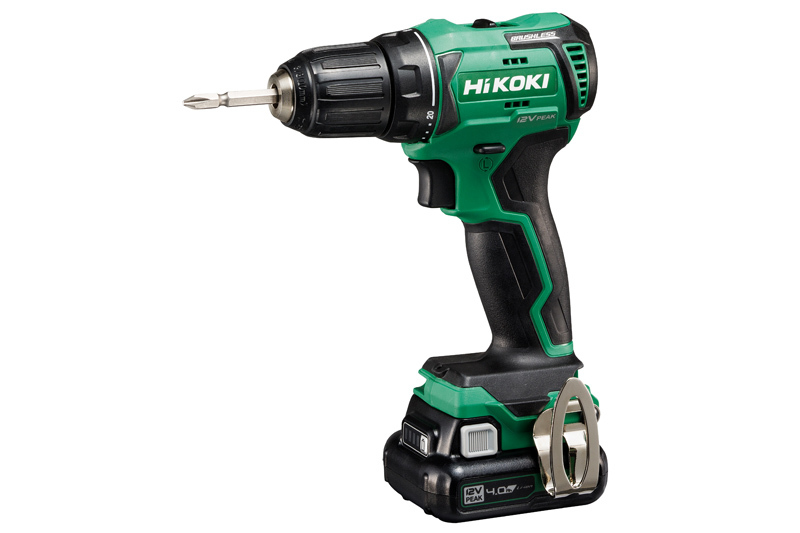 Battery and cordless tool range from Hikoki Power Tools. The 12V Peak Slide cordless tool series has been unveiled by Hikoki Power Tools. The new slimline slide 12V battery range powers the DS12DD brushless cordless driver drill, the DV12DD brushless cordless impact driver drill and the WH12DD brushless cordless impact driver. Battery models BSL1225M and BSL1240M have a capacity of 2.5Ah and 4Ah respectively, with minimal charging times of 37 and 60 minutes only. The BSL1225M has a height of just 42mm and weighs just 220g, while the BSL1240M stands at 45mm high and weighs only 330g. The BSL1225M and BSL1240M both come with a battery level indicator.